Objectives To examine if, and to what extent, a history of adverse childhood experiences (ACEs) combines with adult alcohol consumption to predict recent violence perpetration and victimisation. Design Representative face-to-face survey (n=12 669) delivered using computer-assisted personal interviewing and self-interviewing. Setting Domiciles of individuals living in England and Wales. Participants Individuals aged 18–69 years resident within randomly selected locations. 12 669 surveys were completed with participants within our defined age range. Main outcome measures Alcohol consumption was measured using the Alcohol Use Disorders Identification Test-Consumption (AUDIT-C) and childhood adversity using the short ACEs tool. Violence was measured using questions on perpetration and victimisation in the last 12 months. Results Compliance was 55.7%. There were strong positive relationships between numbers of ACEs and recent violence perpetration and victimisation in both sexes. Recent violence was also strongly related to positive AUDIT-C (≥5) scores. In males, heavier drinking and ≥4ACEs had a strong multiplicative relationship with adjusted prevalence of recent violent perpetration rising from 1.3% (95% CIs 0.9% to 1.9%; 0 ACEs, negative AUDIT-C) to 3.6% (95% CIs 2.7% to 4.9%; 0 ACEs, positive AUDIT-C) and 8.5% (95% CI 5.6% to 12.7%; ≥4ACEs, negative AUDIT-C) to 28.3% (95% CI 22.5% to 34.8%; ≥4ACEs, positive AUDIT-C). 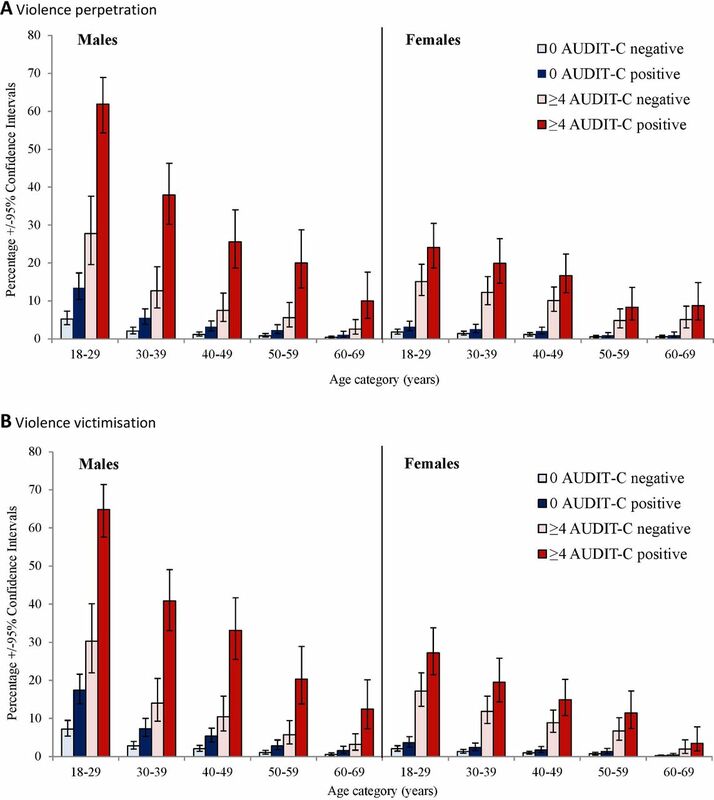 In both sexes, violence perpetration and victimisation reduced with age independently of ACE count and AUDIT-C status. The combination of young age (18–29 years), ≥4ACEs and positive AUDIT-C resulted in the highest adjusted prevalence for both perpetration and victimisation in males (61.9%, 64.9%) and females (24.1%, 27.2%). Conclusions Those suffering multiple adverse experiences in childhood are also more likely to be heavier alcohol users. Especially for males, this combination results in substantially increased risks of violence. Addressing ACEs and heavy drinking together is rarely a feature of public health policy, but a combined approach may help reduce the vast costs associated with both. We examined the combined contribution of current alcohol consumption and history of childhood adversity to violence perpetration and victimisation; an area poorly addressed by existing research. A large random sample (n=12 669) was used from populations across England and Wales. Data were collected using established tools to measure exposure to adverse childhood experiences (ACEs) and current alcohol consumption. Overall compliance was 55.7%, but it was not possible to identify any selective bias created by refusal to participate. Data were self-reported and for ACEs retrospective, and recall bias and reluctance to report could have affected results. Exposure to ACEs is also a strong predictor of adolescent and adult problematic alcohol consumption and its consequences (eg, liver disease).4 7 14 15 Alcohol misuse in individuals with a history of ACEs can be a coping strategy used to address insecurities and anxieties rooted in a legacy of abuse, neglect and other sources of chronic childhood stress.16 17 Higher alcohol consumption is also an established catalyst for violence; for instance, around half of all violent acts in England and Wales are thought to be alcohol related.18 A meta-analysis of studies from nine countries found an average of 48% of homicide offenders were reported to be under the influence of alcohol at the time of the offence.19 However, only a minority of individuals become violent with alcohol consumption and surprisingly little attention has been given to whether a history of ACEs is a differentiating feature between aggressive and non-aggressive drinkers at a population level. Multiple laboratory studies in both humans and animals have already identified that only a subset of individuals become aggressive after alcohol consumption and such individuals are more likely to have behavioural and neurological features consistent with a propensity for violence.22 At a population-level empirical data relating to a history of ACEs, typical drinking behaviour and their combined contribution to involvement in violence are largely absent. Here, we use a series of large national surveys specifically to examine if, and to what extent, a history of ACEs and recent alcohol consumption independently, and in combination, predict perpetration of and victimisation from violence over the past 12 months. For the purposes of this study, we pool data from four cross-sectional ACE surveys delivered in England and Wales using face-to-face data collection at the home of each respondent. In the three English studies (online supplementary table S2), selected addresses were sent letters describing the study, identifying when the researchers might visit and providing information on how to opt out. In Wales, letters were presented to potential participants by researchers when they visited selected addresses. All surveys used face-to-face data collection at respondents’ places of residence and a combination of CAPI (computer-assisted personal interviewing) and CASI (computer-assisted self-interviewing) for some sensitive questions (eg, those on experiencing ACEs). Paper-based questionnaires were also available for those preferring that medium and surveys were available in multiple languages (including French, Spanish, Polish, Hindi, Punjabi, Urdu, Gujarati, Bengali, Marathi, Pashto, Sindhi, Saraiki, Balochi and Welsh) depending on the ethnic profile of the target population. Potential participants were given a study information sheet outlining its purpose and the voluntary, confidential and anonymous nature of participation. In all cases, individuals were informed that they were free to withdraw at any point and that withdrawal would not affect any aspects of health treatment or other service provision. Those consenting and meeting the inclusion criteria (within age range, cognitively able to participate in a face-to-face interview and resident in the selected LSOA) completed the questionnaire. Across all four samples, weighted average compliance was 55.7% (see online supplementary table S2 for response rates for individual samples) giving a total sample size of 13 161. However, the upper age range for Blackburn with Darwen was 70 years (cv. 69 years for all other samples (see online supplementary table S2). In order to ensure that all data in the pooled analyses covered the same age range individuals aged 70 years in the Blackburn with Darwen sample were excluded along with any individuals (in all surveys) who did not complete all questions on ACEs, alcohol or violence. This resulted in a final sample of 12 669 (male, n=5702; female n=6967; table 1). Statistical analyses used SPSS V.22. Analyses employed X2 and X2 for a trend techniques for initial bivariate analyses and logistic regression modelling to examine the independent relationships between ACEs, alcohol consumption and violence. Adjusted means for recent violence perpetration and victimisation were calculated based on logistic regression models using the estimated marginal means function.34 With known differences in levels and characteristics of violence experienced by males and females,18 all analyses examined males and females separately. All models included study sample as a variable to account for unrecorded differences between samples. The study did not involve patients. Study findings are being made available to participants from the general public via reports and open access journal articles. The participant information sheet provided a web address for participants to access published reports and contact details if they preferred to request publications directly from the research team. Nearly twice as many men as women reported being a perpetrator of recent violence and more than twice as many being a victim (table 1). Individuals who had perpetrated recent violence were also more likely to report being recent victims (women, X2=1629.71, p<0.001; men, X2=2556.15, p<0.001). In both sexes, there were strong positive relationships between numbers of ACEs experienced and both violence perpetration and victimisation in adulthood (table 1). For example, only 2.8% of men with no ACEs reported having perpetrated violence in the past year rising to 27.0% with ≥4 ACEs. Equally, in both sexes AUDIT-C positive scores were significantly associated with higher recent violence perpetration and victimisation. Perpetration and victimisation decreased consistently (for men and women) with age and increased with increasing deprivation; although the relationship between deprivation and violence perpetration in women barely reached significance (table 1). Only violence in males showed any significant relationship with ethnicity, with Asian ethnicity associated with lower levels of victimisation. Further, while study sample had no relationship with violence in women and region of residence, levels of perpetration and victimisation for males were higher in the Welsh and North England samples. In both sexes, increasing ACE count was significantly related to higher prevalence of AUDIT-C positive (ACE categories 0, 1, 2–3, ≥4, respectively: AUDIT-C positive; males, 31.6%, 42.8%, 41.4%, 53.2%, χ2=112.107, p<0.001; females, 15.7%, 22.8%, 22.3%, 32.1%, χ2=118.314, p<0.001). Table 2 examines the independent contributions of AUDIT-C and ACE count variables to violence perpetration and victimisation. In both sexes, ACE count and AUDIT-C status remained strongly related to violence, with significantly higher levels of violence perpetration and victimisation with AUDIT-C positive scores and at all ACE counts (vs 0 ACEs); except for perpetration of violence in females with one ACE. Age was also independently associated with both perpetration and victimisation with decreasing involvement in each as age increased. After correcting for ACEs and AUDIT-C, there were no significant effects from ethnicity or deprivation on violence perpetration or victimisation (table 2). As with bivariate analyses (table 1), study location remained a predictive factor for perpetration and victimisation in men but not in women (table 2). Interactions between ACE count and AUDIT-C status as well as for each with age were also included in the model. For men only interactions between ACE count and AUDIT-C significantly contributed to violence perpetration and victimisation models; no interactions with age were significant. Adjusted mean percentage of individuals involved in recenta violence within each ACE count category stratified by AUDIT-C status (A) violence perpetration (B) violence victimisation. Adjusted means are calculated using an estimated marginal mean methodology (see Methods section). AUDIT-C positive indicates a score of ≥5 and negative ≤4. aRecent=in last 12 months. ACE, adverse childhood experiences; AUDIT-C, Alcohol Use Disorders Identification Test-Consumption. Logistic regression models were used to calculate adjusted means (adjusted to overall sample characteristics) for violence perpetration and victimisation by ACE count and AUDIT-C status (figure 1A,B; unadjusted means of perpetration and victimisation rates are presented in online supplementary table S3). For both sexes, violence perpetration and victimisation were higher in all ACE count categories when combined with a positive AUDIT-C with greatest increases seen for perpetration in those with ≥4 ACEs. Thus, for males, prevalence of perpetration in those with ≥4 ACEs and AUDIT-C positive was over three times the levels in those with ≥4 ACEs but AUDIT-C negative (figure 1A). For women, perpetration was also higher with a positive AUDIT-C (figure 1A). However, while this difference was again greatest in the ≥4 ACEs category, the increase in violence perpetration with AUDIT-C positive was not as marked as with men. With age also contributing significantly to the model (table 2), adjusted means were calculated for each age group (figure 2A,B). Recent violence perpetration by males in those aged 18–29 years reduced from a peak of 61.9% where there was both a positive AUDIT-C and ≥4 ACEs to only 5.3% in the same age group for those with no ACEs and a negative AUDIT-C. Female respondents (aged 18–29 years) showed a similar, although less marked, reduction from 24.1% to 1.8%, respectively (figure 2A). Recent victimisation followed a similar pattern with, for instance, prevalence in women aged 18–29 years falling from 27.2% in those with a positive AUDIT-C and ≥4 ACEs to only 2.1% in those with no ACEs and a negative AUDIT-C (figure 2B). For both sexes and both perpetration and victimisation, prevalence reduced with age in all ACE count and AUDIT-C combinations (figure 2; table 2). However, even at ages ≥50 years in both sexes modelled estimates suggest higher risks of perpetration and victimisation in those AUDIT-C positive with ≥4 ACEs. While in those with ≥4 ACEs across all age groups, a negative AUDIT-C was associated with a reduced risk of perpetration and victimisation in men (vs AUDIT-C positive and ≥4 ACEs), this was less marked in women. Adjusted mean percentage of individuals involved in recenta violence with no and ≥4 ACEs within age groups, stratified by AUDIT-C status (A) violence perpetration (B) violence victimisation. Adjusted means are calculated using an estimated marginal mean methodology (see Methods section). AUDIT-C positive indicates a score of ≥5 and negative ≤4. aRecent=in last 12 months. ACE, adverse childhood experiences; AUDIT-C, Alcohol Use Disorders Identification Test-Consumption. Consistent with studies elsewhere7 22 35 36 this study showed that both higher alcohol consumption and increased ACEs independently contribute to greater involvement in violence for both sexes as both perpetrators and victims (table 2). Critically, however, when high ACE counts and higher alcohol consumption occur in males, there appears to be a substantive multiplicative increase in risks of violence (figure 1). Thus, in men, prevalence of violence perpetration was 3.6% in those with an AUDIT-C positive only and 8.5% in those with ≥4 ACEs count only (including the baseline risk of 1.3% with neither condition). By comparison, when both conditions were present, violence perpetration prevalence was 28.3%; 2.3 times higher than the combined individual risks (figure 1A). These findings are consistent with a proportion of drinkers being particularly susceptible to developing violent tendencies when drinking alcohol.20 37 Results here suggest that such susceptibility to alcohol-related violence, especially in men, may be based in childhoods affected by multiple types of adversity. The Crime Survey for England and Wales estimates that, in those aged ≥16 years, 1.3 million violent incidents occurred in 2015/2016 of which 40% were alcohol related.18 While results here cannot identify how many such incidents are related to combined ACEs and heavy adult drinking, this may account for a substantive proportion. Heavy drinking with high ACEs is relatively common as individuals with more ACEs are also more likely to be heavier drinkers; a finding consistent with studies elsewhere.6 38 Thus, 8.6% of males here reported ≥4 ACEs (cv. other countries, eg, USA, 15%39; Philippines, 10%40) with over half (53.2%) AUDIT-C positive; resulting in nearly 1 in 20 males with a ≥4 ACE-AUDIT-C positive combination. This subpopulation has an estimated violence perpetration prevalence 21 times higher than males with no ACEs and AUDIT-C negative (figure 1A) and victimisation rate 17 times higher (figure 1B). For women, there are multiple well-established genetic and cultural factors contributing to lower levels of violence perpetration than in men.41 42 Here, although women suffered similar ACE counts to men, recent violence perpetration was lower across all ACE counts (table 1, figure 1A). Further, while there was an additive impact of ACEs and AUDIT-C status in women, there was no substantive multiplicative effect in those with ≥4 ACEs. Our data cannot identify mechanisms that might underlie differences in sexes. However, how much violence results from alcohol reducing impulse control should depend on the strength of violent impulses otherwise suppressed through the PFC control. 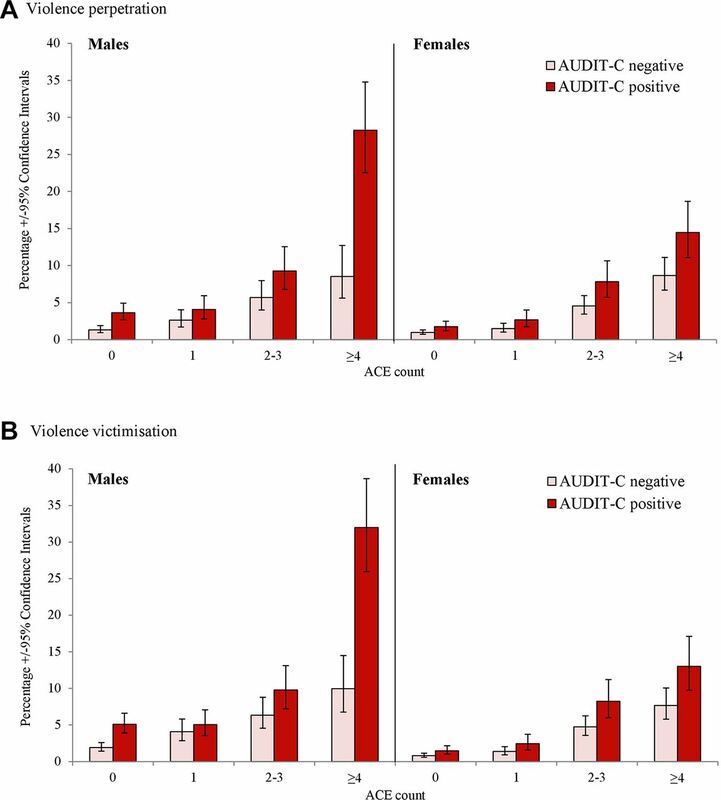 Our results would suggest a more extensive underlying propensity for violence in males with ≥4 ACEs, a greater impact of heavier alcohol consumption on PFC control or a combination of both. Further, women typically have a greater tendency to self-directed violence (eg, self-harm) and such behaviour, while related elsewhere with alcohol43 and ACEs,7 was not measured here. This study has some important limitations. The samples were demographically representative of the populations being studied3 27 but overall compliance was only 55.7%. However, it is not possible to identify or exclude any selective bias created by refusal to participate. Data were self-reported and in the case of ACEs retrospective. Recall bias and any reluctance to report certain current behaviours or historical experiences could also have affected results. Our data suggest multiplicative effects on risk of violence when multiple ACEs and heavier alcohol use are combined in men. However, analyses presented here are based on retrospective and cross-sectional data and alone cannot establish causality. Longitudinal studies are required to sequentially examine the independent and combined impacts of childhood adversity and adult alcohol consumption on involvement in violence. Moreover, laboratory work is needed to understand any mechanisms underpinning such relationships including the potential role of hormonal and other differences between sexes that have previously been linked with aggression.41 52 Our measures of violence were also limited to single questions on perpetration and victimisation as well as to behaviour in the last 12 months. Research is required to examine relationships between ACEs, alcohol and severity of violence or types of violence (eg, public or domestic settings). Such distinctions are considerations for future studies in order to describe how violence resulting from ACEs in one generation may contribute to increased violence against women and children and consequently higher ACEs in subsequent generations. Violence is an international economic and public health challenge resulting in over half a million deaths and costing an estimated $14 trillion per year globally.53 54 A large proportion of violent deaths19 and non-fatal violence36 is alcohol related. Results here are consistent with heavier alcohol consumption, especially in males, eroding executive control over violent tendencies established by exposure to multiple ACEs and consequently contributing to substantially increased engagement in adult violence. Interventions to restrict alcohol consumption in those with a history of violence are already in use.55 However, examining the ACE exposure of patients and offenders may help better identify those who will benefit from programmes as well as those who use alcohol as part of an ACE coping strategy. Thus, addressing the legacy of ACEs in such violent individuals may help control aggression and reduce the need for heavy drinking. For most legal drugs, their sale is dependent on informing users about their potential adverse reactions and the types of conditions that make individuals susceptible to them. A greater public awareness of the relationships between ACEs, alcohol and violence may help individuals manage their own risks of violence as well as risks relating to those around them. For over two thousand years, established wisdoms such as in vino veritas (in wine truth) suggest that alcohol exposes underlying traits which people otherwise attempt to suppress. Results here support such wisdom and provide epidemiological evidence that violent impulses established in childhood can be exposed by alcohol consumption. We are very grateful to the residents of England and Wales who kindly participated in the surveys and to the staff of BMG research and Future Focus Research for data collection. We would also like to thank Caoimhe Martin, Alisha Davies, Kathryn Ashton, Nicola Leckenby, Nadia Butler, Zara Quigg, Helen Lowey, Dominic Harrison, Ann Robins, Peter Barker, David Conrad, Kelly O’Neill, Chandraa Bhattacharya and Barbara Paterson for their support with the development and delivery of the research.
. Evolutionary foundations of developmental psychopathology. Cicchetti D , Developmental Psychopathology, Vol. 2: Developmental Neuroscience (3rd edition). New York: Wiley & Sons, 2016:1–58.
. Aggression grows up: looking through an evolutionary developmental lens to understand the causes and consequences of human aggression. In: Shackelford TK , Hansen RD , eds. The evolution of violence. New York: Springer-Verlag, 2014:159–86.
. Focus on violent crime and sexual offences, England and Wales: year ending mar 2016. 2017 https://www.ons.gov.uk/peoplepopulationandcommunity/crimeandjustice/compendium/focusonviolentcrimeandsexualoffences/yearendingmarch2016 (accessed 11 Jul 2017).
. The prevalence of alcohol-involved homicide offending: a meta-analytic review. Homicide Stud 2014;18:251–70. Department for Communities and Local Government. The English Indices of Deprivation 2015 – frequently asked questions. https://assets.publishing.service.gov.uk/government/uploads/system/uploads/attachment_data/file/579151/English_Indices_of_Deprivation_2015_-_Frequently_Asked_Questions_Dec_2016.pdf (Accessed 9 May 2018). Office of National Statistics. Welsh Index of Multiple Deprivation. http://gov.wales/statistics-and-research/welsh-index-multiple-deprivation/?lang=en (Accessed 1 Dec 2015).
. Adverse childhood experiences in Hertfordshire, Luton and Northamptonshire. Liverpool: Centre for Public Health, 2016.
. Adverse childhood experiences and their impact on health-harming behaviours in the Welsh population. Cardiff: Public Health Wales, 2015. IBM. IBM SPSS advanced statistics 22. Armonk, NY: IBM Corporation, 2013.
. The world report on violence and health. Geneva: World Health Organization, 2002.
. Intergenerational transmission of violence. In: Lindert J , Levav I , eds. Violence and mental health. Netherlands: Springer, 2015:27–45. The Institute for Economics and Peace. The economic value of peace 2016: measuring the global economic impact of violence and conflict. Sydney: Institute for Economics and Peace, 2016. Contributors MAB and KHu designed and directed the studies. MAB undertook the analyses and wrote the first draft of this manuscript. KHu and KF coordinated study implementation, contributed to data management and edited the manuscript. KHa contributed to data management and manuscript editing. SE, OS and SW contributed to literature review, data quality assurance and manuscript editing. Funding The studies were funded by Public Health Wales; Public Health England; Luton, Northamptonshire and Hertfordshire Councils; Higher Education Funding Council for England; and National Health Service Research and Development Funds. Ethics approval Ethical approval for all studies was obtained through Liverpool John Moores University Research Ethics Panel with additional approval provided by Public Health Wales for the Welsh survey. Data sharing statement The datasets analysed in the current study are available from the corresponding author on reasonable request. © Author(s) (or their employer(s)) 2018. Re-use permitted under CC BY-NC. No commercial re-use. See rights and permissions. Published by BMJ. This is an open access article distributed in accordance with the Creative Commons Attribution Non Commercial (CC BY-NC 4.0) license, which permits others to distribute, remix, adapt, build upon this work non-commercially, and license their derivative works on different terms, provided the original work is properly cited, appropriate credit is given, any changes made indicated, and the use is non-commercial. See: http://creativecommons.org/licenses/by-nc/4.0/.